I am pleased to have Sonia Pressman Fuentes as my guest on the Coffeehouse this week. Ms. Fuentes is a remarkable woman to say the least. Not only is she a natural storyteller, she is also the first woman attorney in the General Counsel's Office at the Equal Employment Opportunity Commission, a founder of the National Organization for Women and an international speaker on women's rights. In 1966, Betty Freidan and a small group of women planned an organization that later became known as the National Organization of Women (NOW). On a paper napkin, Betty wrote that the purpose of the organization was "to take the actions needed to bring women into the mainstream of American society, now, full equality for women, in fully equal partnership with men." Twenty-eight of those women signed up as NOW's first founders. Another twenty-six, of whom Sonia was one, met at an organizing conference that October and drafted a statement of purpose and skeletal bylaws. In order to get the EEOC to enforce Title VII for women, NOW filed lawsuits, petitioned the EEOC for public hearings, picketed the EEOC and the White House, and generally mobilized public opinion. 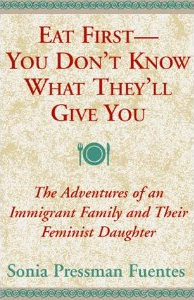 Sonia's debut novel "Eat First - You Don't Know What They'll Give You" is the wonderfully written story of Sonia Pressman Fuentes and her family. Eat First is the sometimes poignant, often hilarious, always fascinating chronicle of trials and tribulations. Beginning with the almost didn't happen wedding of her parents in Poland, moving on to the family's immigration to the United States to escape the Nazis and continuing with Sonia's own story, the adventures are non-stop.